Gamma Eta Omega sponsored a child in the "Angel Tree" program on Friday, December 13, 2013 at Mount Pilgrim Baptist Church, 9700 Scenic Highway in Baton Rouge, Louisiana. The Angel Tree program provides Christmas gifts to children of incarcerated parents. 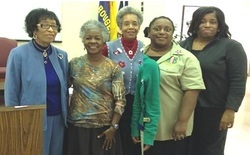 Several Gamma Eta Omega sorors attended the program l-r ( Verta Bilberry, Robertine Bruns (Chair), Saundra McGuire, Joanie Chavis, and LaChondria Holder). In honor of the life and legacy of the Reverend Doctor Martin Luther King, Jr., and in the spirit of perpetuating the principles of non-violence, humanity, community, and service, five Baton Rouge area chapters of Alpha Kappa Alpha Sorority, Incorporated in partnership with City Year Baton Rouge, served as hostesses of the first annual 2013 MLK Day Youth Summit Service for Peace Project on January 21, 2013 at Capitol Middle School in Baton Rouge, Louisiana from 9:30 a.m. to 2:00 p.m. The summit united over an estimated 150 students from the Baton Rouge area with over 300 community volunteers. It was the goal of the organizers of the summit to impart upon the students the principles of Dr. King and empower them with the tools and skills necessary to go back into their communities and to be the leaders and forces of change. The summit also served as a launch event for the 40 Days of Peace Project, designed to enable people to make a difference in their own lives and the lives of other by acting peacefully for the 40 Days beginning with MLK Day through March 1, 2013. The 40 Days of Peace Pledge and 40 Acts of Peace were introduced to the participants at the summit, and each student was provided with a copy of the Peace Pledge to take home with them and reflect upon throughout the next 40 days, as well as a calendar of 40 Acts of Peace that they are encouraged to execute for each of the 40 days following the summit through March 1, 2013. Following the launch event, the 40 Days of Peace curriculum was integrated into activities with the EYLs. A culminating activity with the EYLs and the members of the chapter was also held in March 2013. The program was sponsored on a national level by Service for Peace, a Corporation for National and Community Service in partnership with Alpha Kappa Alpha Sorority, Incorporated.